'Stand by love' was released in 1991 as the third single from their tenth album 'Real life'. The song was written by Charlie Burchill and Jim Kerr and was produced by Stephen Lipson. The B-side was recorded live at the Universal Amphitheatre, Los Angeles (USA) on June 19, 1991. 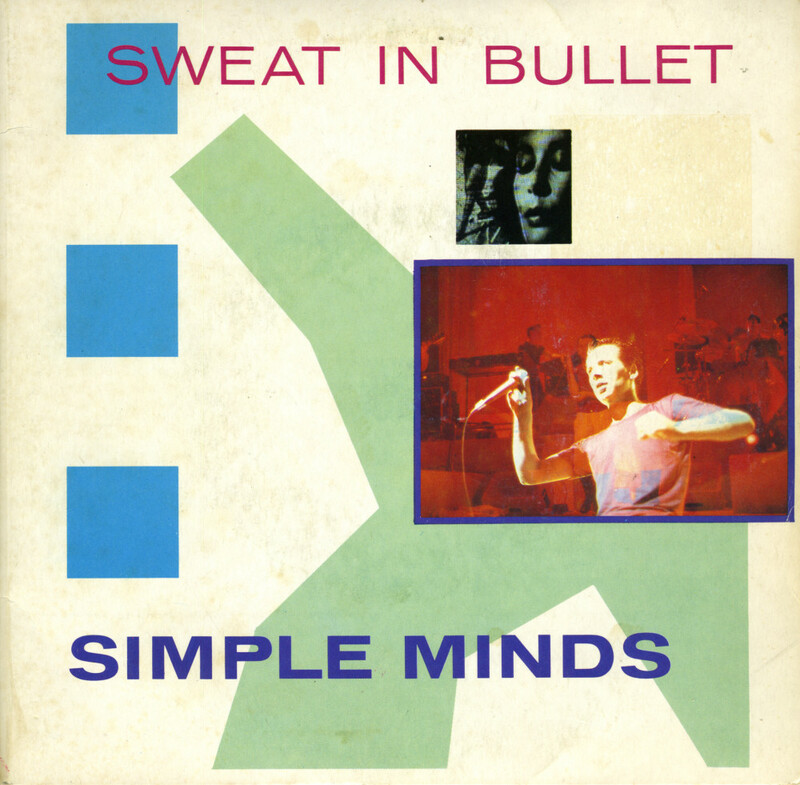 'Sweat in bullet' was released in 1981 as the second single from Simple Minds' fourth album 'Sons and fascination'. The single was released as a special double single, featuring a second disc with two live recordings from a performance at the Hammersmith Odeon on September 25, 1981. The single became a modest hit for the band, reaching number 52 in the UK singles chart, number 47 in New Zealand and number 17 in Sweden. 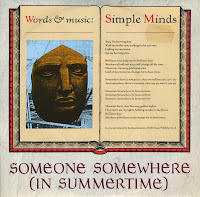 I think 'Someone somewhere (in summertime)' is my favourite Simple Minds song of all times. Still, it took me this long to find a copy of the single. Fortunately, it is a UK pressing so that's made it worthwhile waiting. The track was released as the third and final single from the bands' 1984 album 'New gold dream'. It reached number 36 in the UK singles chart and number 19 in Ireland. In Europe, the single was ignored. How very strange. 'Sanctify yourself' was released as the second single from the Simple Minds' 1986 album 'Once upon a time', their seventh studio album. Released in the wake of their biggest hit 'Don't you (forget about me)' (1985), the band were able to ride the wave of success for some time. This single reached number 10 in the UK singles chart, number 11 in the Dutc hTop 40 and number 14 in the US Billboard Hot 100 chart. This double single set features a second disc with two live recordings, recorded at the Ahoy' in Rotterdam on December 3, 1985. 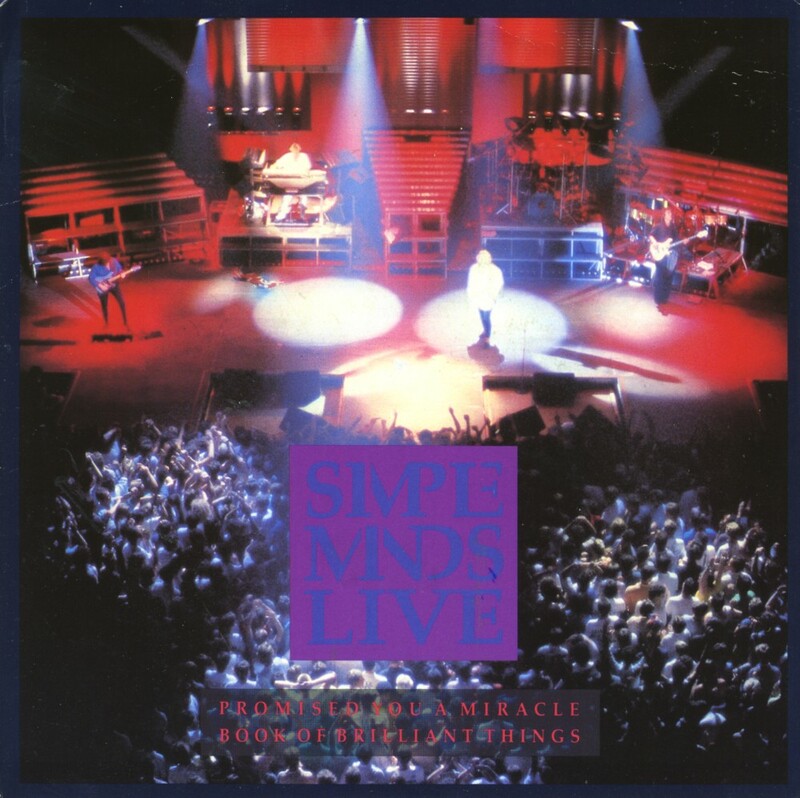 In 1987, the Simple Minds released the album 'Live in the city of light', which as the name vaguely describes, was a recording of their concerts at Le Zenith in Paris on August 12 and 13, 1986. The live recording of 'Promised you a miracle' was released as the first and only single from this album in order to promote the album. One has to wonder at this: the live version doesn't add to the studio version but rather detracts from it because it's sung so flatly. The single still managed to reach number 19 in the UK singles chart. 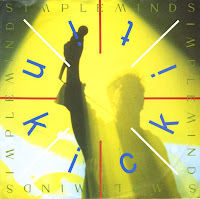 'Kick it in' was released as the third single from the 1989 Simple Minds album 'Street fighting years'. Although I wasn't that convinced that this song was actually any good, I was curious about the 89 remix of 'Waterfront', which is included on the B-side of this single. And so it still ended up in my collection. The single reached number 15 in the UK singles chart, while also making number 29 in the Dutch Top 40. 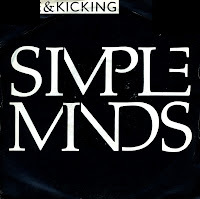 The Simple Minds released five singles from their 1989 album 'Street fighting years', of which the first and the last one were EP's. The first EP was the 'Ballad of the streets EP', the second one was the Amsterdam EP. Three tracks were included on this EP, of which only 'Let it all come down' was taken from the album. 'Jerusalem' is an instrumental track written by Hubert Parry and arranged by the Simple Minds, and 'Sign o' the times' is a cover of the Prince track. The EP reached number 18 in the UK singles chart and the Dutch Top 40. 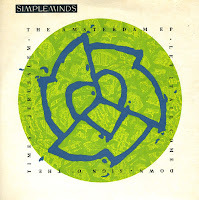 'Hypnotised' was the second single taken from the Simple Minds' 1995 album 'Good news from the next world'. The 7" single was a numbered limited edition. This is number 1839. The single was not as big a success as earlier releases from the band. It reached number 18 in the UK singles chart, but it stalled outside the top 20 in Germany, Ireland and Canada. In other countries, the single didn't even chart. And things would get even worse: subsequent singles were a hit in the UK and sometimes Germany only. Gone were the stadium-filling days of the late Eighties - although the band still manages to fill the bigger concert halls. By 1995, the Simple Minds had become 'the former super group'. The line-up had diminished to Jim Kerr and Charlie Burchill, using session musicians for their tenth album 'Good news from the next world'. The album was reviewed positively in the USA, but in the UK, critics panned the album. 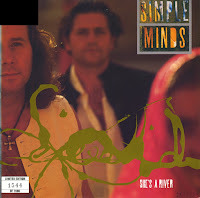 The single 'She's a river' preceded the release of the album, and was released in a limited edition of 7000 copies on 7". (I have number 1544.) The single reached number 9 in the UK singles chart and number 13 in the Dutch Top 40. 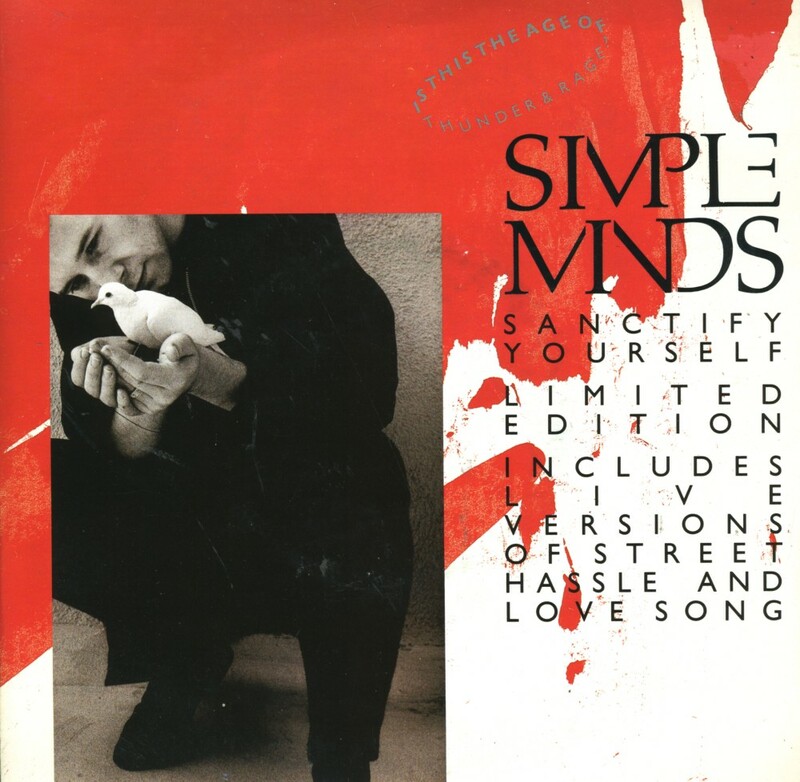 'Love song' is a track from the Simple Minds' 1981 album 'Sons and fascination'. It was originally released as a single in the same year, peaking at number 47 in the UK singles chart. Not only was it their biggest success in the UK up to that point, it was also their first single to chart outside the UK: in Australia and Canada, peaking at number 17 and 38 respectively. 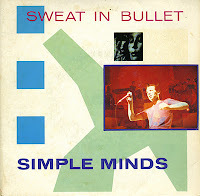 The track was re-released as a double A-side single, coupled with their 1985 hit 'Alive and kicking', in 1992 to promote the compilation album 'Glittering Prize 81/92'. This single reached number 6 in the UK singles chart and number 24 in Ireland. 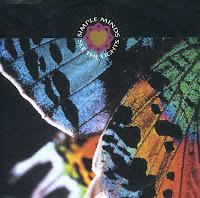 'See the lights' was the second single released from Simple Minds' 1991 album 'Real life'. The track was remixed and edited for the single. It was a moderate success for the Scottish band, reaching number 20 in the UK singles chart and number 10 in Canada. 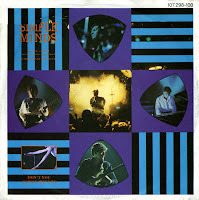 Released in 1982, 'New gold dream' was the fifth album of the Simple Minds. 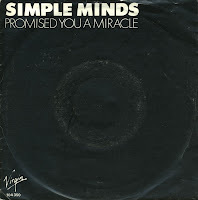 The single 'Promised you a miracle' was the first one taken from the album, released in April 1982. It was their first single to generate success on the European continent, as it reached number 24 in the Dutch Top 40. In the UK, it was their fifth chart single, although it was the first one to actually break the top 40, peaking at number 13. 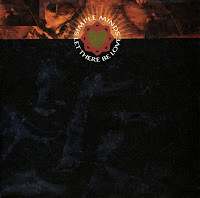 The first single from the Simple Minds' 1991 album 'Real life' was 'Let there be love'. Although the song still had a very full sound, gone were the days of stadium rock and misplaced missionarism. Jim Kerr was becoming less of a Bono clone and started focusing on music again. What a nice change. The single reached number 6 in the UK singles chart and number 4 in the Dutch Top 40. The single version was an edit of the album version. 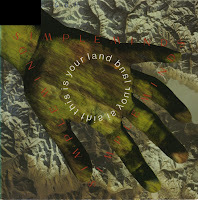 'This is your land' was released as the second single from the Simple Minds' 1989 album 'Street fighting years' in April 1989. The song was written and composed by the band and features Lou Reed as guest vocalist. The single peaked at number 13 in the UK singles chart and number 6 in the Dutch Top 40. It's quite a long single, as both sides clock in at over six minutes. Great value for money! 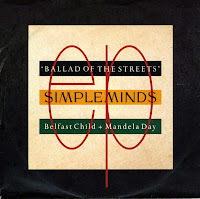 I still remember vividly the first time I heard 'Belfast child' by the Simple Minds. It was a Saturday evening and I had a splitting headache. I'd taken a few pills to combat this, and started playing some music. As always, I'd borrowed the new cd-singles my sister had bought, and this was one of them. I was listening to this new track with a lot of attention and was very impressed with the buildup and climax near the end of the track. When the song was over, my headache was gone. The song uses the music from the Irish folk song 'She moved through the fair', but has completely different words. Jim Kerr commented: 'I first heard the melody a few days after the Enniskillen bombing, and like everybody when you see the images I was sick. In the second part of the song, I'm trying to relate to people in Northern Ireland who lost loved ones. I'm trying to talk about the madness, the sadness and the emptiness. I'm not saying I have any pearls of wisdom, but I have a few questions to ask.' 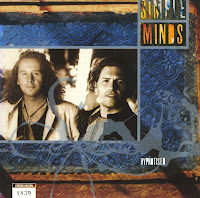 The single, released in early 1989, reached number 1 in the UK, Ireland and the Netherlands. 'Don't you (forget about me)' was released in April 1985 and made a big impression on me right away. I loved the song, and the fact that my record shop was selling it cheaply for one week only meant that I had it even before it charted. It's a purchase I regretted for a long time, because the song was played so often and became such a big hit that I didn't play the single for years on end. 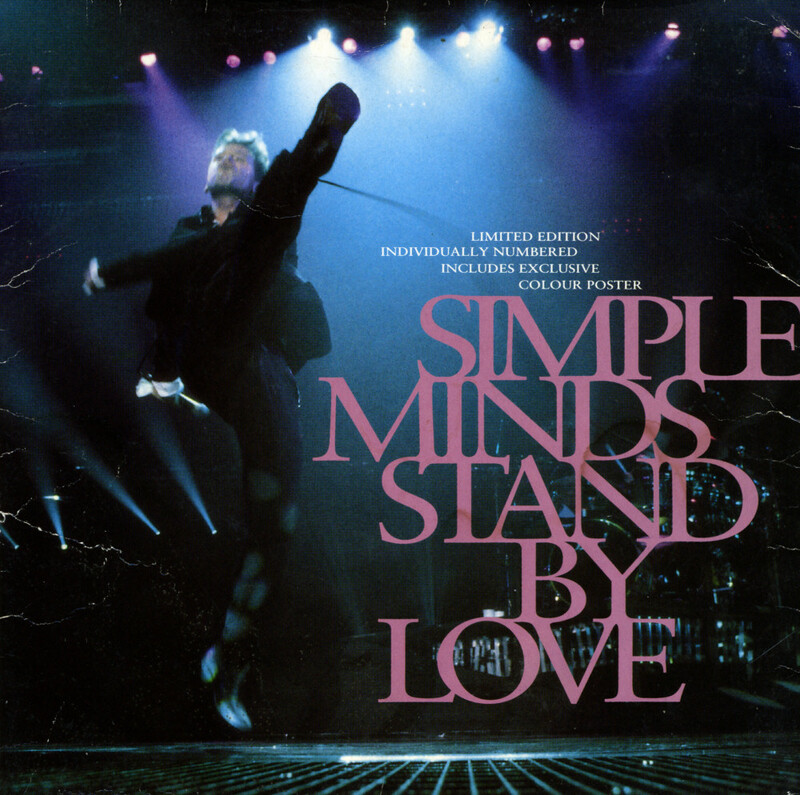 The song was written by Keith Forsey and Steve Schiff for the soundtrack of the movie 'The breakfast club'. Forsey asked both Bryan Ferry and Billy Idol to record the song, but both declined, although Idol would later perform a cover of it on his 2001 greatest hits compilation. Schiff then suggested the Simple Minds, who initially refused as well, but then were persuaded by their record company to do it. The band reportedly rearranged and recorded 'Don’t you (forget about me)' in three hours in a north London studio and promptly forgot about it'. The single reached number 1 in the USA, Canada and the Netherlands, while in the UK it reached number 7. Despite its success, the band continued to dismiss the song; the most obvious slight being its absence from their subsequent album 'Once upon a time'. It finally appeared on their 1992 compilation album 'Glittering prize 81/92'. 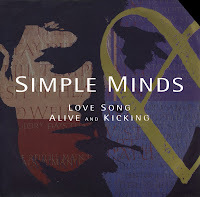 'Alive and kicking' was released as a single from the Simple Minds' 1985 album 'Once upon a time'. The single featured a single version that was 40 seconds shorter than the album version. However, the instrumental version on the B-side was 35 seconds longer, clocking in at 6 minutes. The single reached number 7 in the UK singles chart, number 3 in the US Billboard Hot 100 and number 2 on the Dutch Top 40. 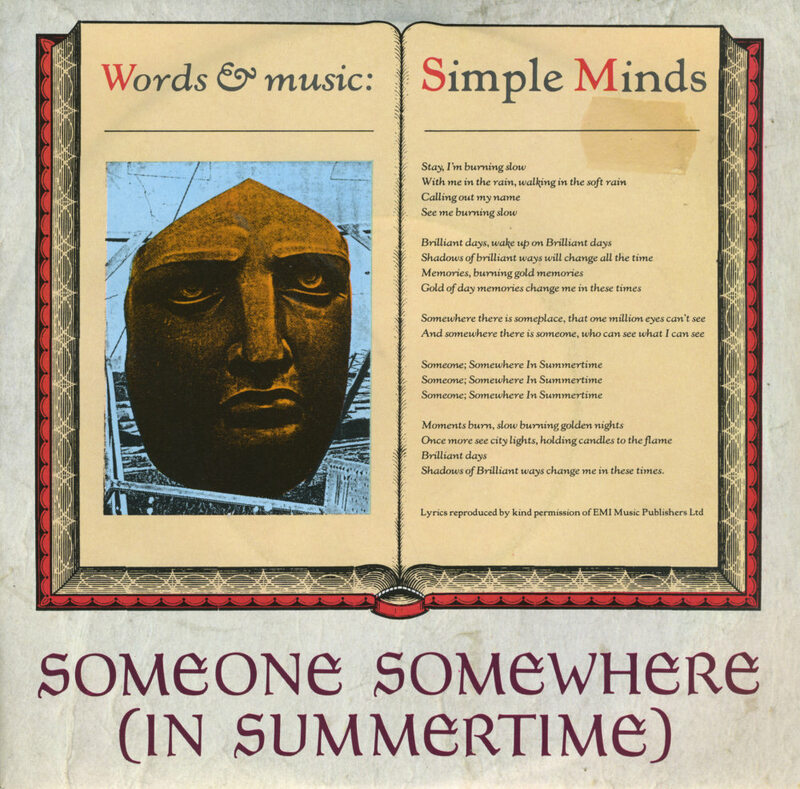 The early Simple Minds material has a certain quality their later songs did not have. It featured a sparser sound, it rocked like hell and the production by Steve Lillywhite was always spot-on. 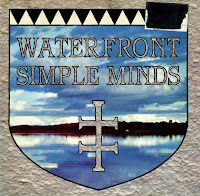 Their 1983 single 'Waterfront' sounded a bit like U2, that other band that was just coming up around that time. The single was a massive hit in New Zealand, where it topped the chart. It also reached number 13 in the UK singles chart. I found my copy of the single during a festival market. The dealer which I bought this single from, had obviously been in London; the sticker from the Record Exchange was still on the sleeve. 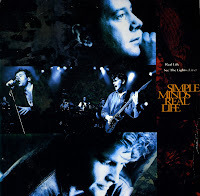 'Real life' was released as the fourth single from the Simple Minds' 1991 album 'Real life'. Released in October 1991, it was the first time since 1984's 'Up on the catwalk' that a single by the band stalled outside the top 20 of the UK singles chart, reaching number 34 only. That's not to say that this is a bad track, because it contains all the hallmarks of a good Simple Minds track. But perhaps it wasn't memorable enough. I mean, even I didn't know I already had the single and bought another copy last week in London. It cost me 10p, so I'm not complaining - but I already had it. The Simple Minds have had enormous success in the Eighties, but they had some difficulties continuing that success after the decade ended. The band effectively fell apart, with Jim Kerr and Charlie Burchill being the only active members. 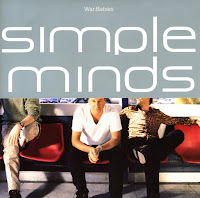 After being released from their contract with Virgin Records in 1998, Simple Minds decided to musically reinvent themselves, using techno influences in their rock music. The resulting album, 'Neapolis', got mixed reviews. 'War babies' was the second single drawn from the album. It reached number 43 in the UK singles chart.